When I was growing up on Sunday's my grandmother would cook Neck bones and Rice with Collard greens and cornbread. It was one of the best meals of the week. I always enjoyed my grandmothers cooking. And over the years I have been handed down her recipes. I hope you enjoy it as much as I have. Bonnies Neck Bones (by: BONNIE) - First, I like to soak the neck bones in vinegar water. Soak the meat for about 1 hour, rinse, then began to boil them to get all the yucky foam off. Then re-rinse them, add fresh water, seasonings, lots of onions and the boil. Cook them until tender then place them in the oven topped with BBQ sauce, bake for about 20 minutes. Enjoy, Bonnie! Delicious (by: Chefin Passaic) - This turned out to be a great recipe. I only added in a few additional spices, because I love different spices. My family did love and enjoy eating these neck bones. I've made this quite a few time. Thanks this recipe is a keeper. A Satisfying Neckbone Meal (by: Lisa) - Delicious! Made this neckbone recipe a few times and the meal is a family pleaser. I followed the recipe exactly just added in a few more vegetables. 1. In the large pot heat oil, then add neck bones and Worcestershire sauce. Brown neck bones until they are no longer pink, about 5 to 10 minutes. 2. Once neck bones brown, add sliced onions, green onions, dry spices and stir. 3. Add water to pot and bring to a boil, cover pot with a tight fitting lid and simmer on low for about 1 1/2 to 2 hours stir only once about an hour into cooking. 4. After cooking time, skim fat off the top. Then add rice and replace tight fitting lid. Simmer 15 more mins and turn off heat, stir once, the replace lid. Wait 15 more minutes to let rice set and then serve and eat. - You can also cook the rice separate and reduce the water to 5 cups on the neck bones. - If you cook the rice separate you can plate the rice and put the neck bones over the rice. - Neck bones and rice go great with cornbread, and collard greens. Fresh collard greens are better, but if you can not find them at the store you can buy a can and add 2 pieces of bacon to them to add flavor. 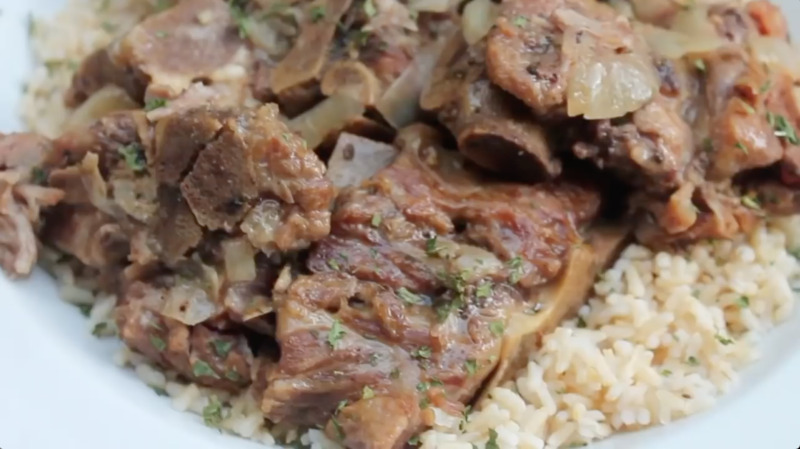 This neck bones and rice recipe serves about 4 to 6 people. Heaven on a Plate (by: Sunshine) - I love neck bones and rice...but I like to cook my neckbones in the crockpot and when they are done, I use the water they were cooked in to make the rice. It's always better in my humble opinion to de-bone the meat, add a couple of chopped boiled eggs and a cup of chopped celery, then mix it all together. Season to taste. Scrumptious! Mouth Watering in Anticipation (by: A.Laura) - Recently married and didn't feel like a long day in the kitchen but wanted to serve-up something my guys would enjoy. I searched for a recipe that would cause me to go hmmmm? I will update this comment but as of now the kitchen smells like back home in the Heart of Dixie with grandma. Neckbone Soup (by: From North 2 South) - What a great recipe. I just purchased two cases for this fall and winter if they last for making neckbone soup w/my daughter. Great meal (by: Anonymous) - This was a really good recipe. I enjoyed it!